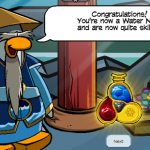 Card-Jitsu Water was added in November 2010, a year after Card-Jitsu Fire came out and two years after the original Card-Jitsu game came out. In order to play this game you must be a member and a black belt ninja. Also, you can buy trading cards in real life at the store, and enter the code that comes with it to unlock more cards to play in the game online. 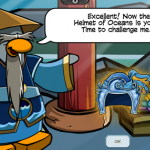 On May 9, 2013 Club Penguin permanently removed the membership restriction from this game. Below is a video of the game in play.